^ Helge von Koch, "Sur la distribution des nombres premiers", Acta Mathematica 24 (1901), pp. 159–182. ^ M.Riesz, "Sur l'hypothèse de Riemann", Acta Mathematica, 40 (1916) pp185-190. ^ Proposed proofs of the Riemann Hypothesis. 2007-07-18. Bernhard Riemann, Ueber die Anzahl der Primzahlen unter einer gegebenen Grösse, (1859) Monatsberichte der Berliner Akademie. Jacques Hadamard, Sur la distribution des zéros de la fonction ζ(s) et ses conséquences arithmétiques, Bulletin Société Mathématique de France 14 (1896) pp. 199–220. Schoenfeld, Lowell. "Sharper bounds for the Chebyshev functions θ(x) and ψ(x). II." Mathematics of Computation 30 (1976), no. 134, 337–360. Daniel Rockmore, Stalking the Riemann Hypothesis : The Quest to Find the Hidden Law of Prime Numbers, Pantheon Books, New York, 2005. ISBN 0-375-42136-X. John Derbyshire, Prime Obsession: Bernhard Riemann and the Greatest Unsolved Problem in Mathematics, Joseph Henry Press (April 23, 2003), ISBN 0-309-08549-7. 448 pages. Ed Pegg, Jr., Ten Trillion Zeta Zeros, (2004) 討論Xavier Gourdon對前十兆個非平凡零點的計算. 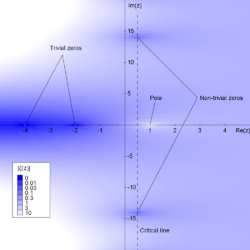 de Vries, The Graph of the Riemann Zeta function ζ(s) (2004). Erica Klarreich, "Prime Time", New Scientist - November 11, 2000, p. 32. 對黎曼猜想的簡介.